Over the past day or so, we've noticed a major change in the Google Play Store. While the main Play Store screen has remained untouched, an overhaul to the "My Apps & Games" tab has arrived aimed at making it much easier to manage updates, and makes far more efficient use of the available space. If you wish to force the update, you can do what we did to our Huawei P10 unit: We simply restarted the device and opened the Play Store. This triggered the change and we were able to see the new "My Apps" UI. The My Apps and Games tab has been shuffled around a bit: There is no longer a "Subscriptions" tab and the "Installed" tab no longer displays updates. 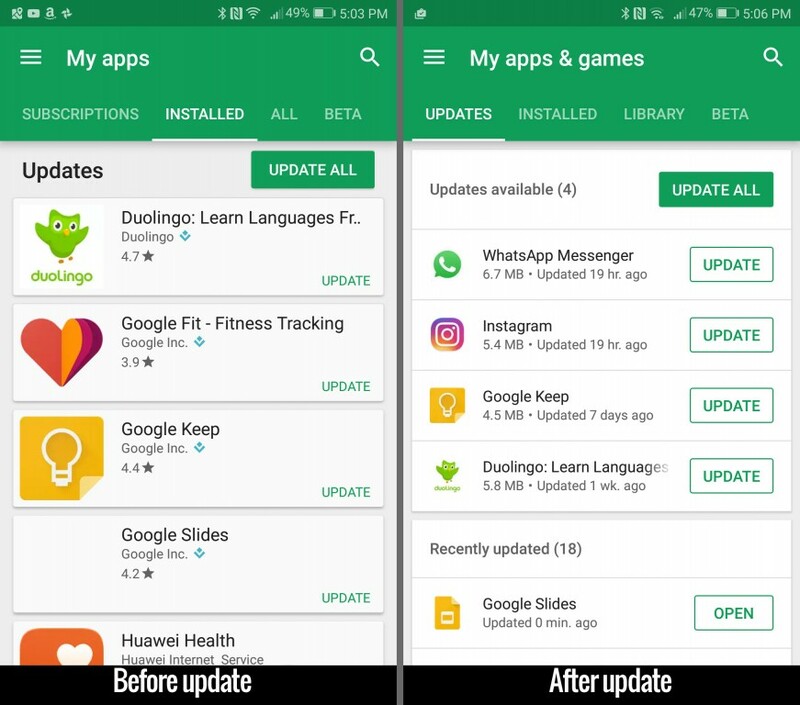 Now, "Updates" gets its own tab and here you'll be able to see which app updates are available, how long ago they became available, and below that, you'll see your most recently updated apps and how long ago they were updated. The most recent updates available show up on top. If you head to the "Installed Tab" this is where you'll see all the apps installed on your device. Now you can sort your apps by Alphabetical order, Last updated, Last used, or Size. This helps to find and uninstall apps that you might use infrequently or delete an app that will clear up some storage space. As you can see, Spotify takes up the most amount of space on this Huawei P10. It makes more sense to call the third tab "Library" instead of the previous: "All". This is where you can see a list of previously installed apps that you may have installed on another tablet or smartphone that used the same google account. Finally, the "Beta" tab stays the same. Here is where you can manage which apps you have installed that are using Beta builds. If you still don't see the new update, just be patient. It seems to be rolling out to everyone now and if it hasn't reached you yet, you should see it appear over the next week or so. I already have it on my old xperia that runs v4.3 JellyBean. Didn't expect that I will receive it. After the update, it hangs and then crashes on my J7 J700F everytime i use it. Not properly done. Tried clearing data/cache. Same problem.